A challenging first person puzzle platformer! 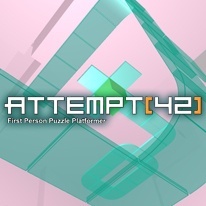 Attempt  is a challenging first person puzzle platformer. In order to clear the level, as fast as possible, you have to defy gravity and change the layout of the level. Rotate the screen and move to the next platform. This game will challenge your problem solving skills and your imagination!